Sports Illustrated has it at #23, but a former team member thinks it should be much higher. LOCATION: Cole Field House, College Park, Md. 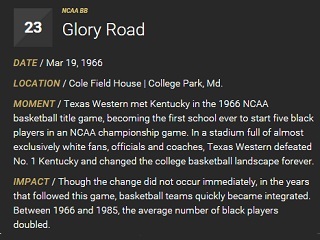 MOMENT: Texas Western met Kentucky in the 1966 NCAA Basketball title game, becoming the first school ever to start five black players in an NCAA championship game. In a stadium full of almost exclusively white fans, officials and coaches, Texas Western defeated No. 1 Kentucky and changed the college basketball landscape forever. IMPACT: Though the change did not occur immediately, in the years that followed this game, basketball teams quickly became integrated. Between 1966 and 1985, the average number of black players doubled. The top sports moment, according to Sports Illustrated, is the amateur U.S. hockey team that downed the Soviet Union in the 1980 Winter Olympics in middle of the Cold War. The event is now known as the Miracle on Ice. “Not even close,” Cager said regarding the comparison of the Miracle on Ice to Glory Road, which is approaching its 50th anniversary next week. A team of SI editors and writers spent months, compiling, analyzing, discussing – and, yes, arguing about – these moments. We recognize that the final list has a largely American viewpoint, and that it covers more from the 60 years that SI has been in print than it does from the centuries that preceded them. We also excluded the infamous events that are remembered for the wrong reasons. We’re sure you won’t agree with this entire list from top to bottom, so we included an interactive ranker tool below. We love the community sports create, and the conversation these games sparks. So share with us your favorite moments in sports history.